Marines from India Company, 3rd Battalion, 4th Marine Regiment speak with local elders during a patrol of She Gosa Janobi, Afghanistan Nov. 16. The patrol was part of Operation North Star which patrolled nearby villages of the notoriously dangerous Buji Bhast Pass Nov. 15 through 17. Lance Cpl. 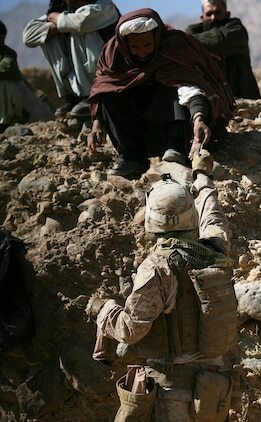 Douglas C. Gilbert, a mortar man with India Company, 3rd Battalion, 4th Marine Regiment hands a meal-ready-to-eat to a local Afghan man during a patrol outside the village of Gund, Afghanistan Nov. 17. The patrol was part of Operation North Star and was part of an attempt to improve relations with local Afghans in the surrounding area. 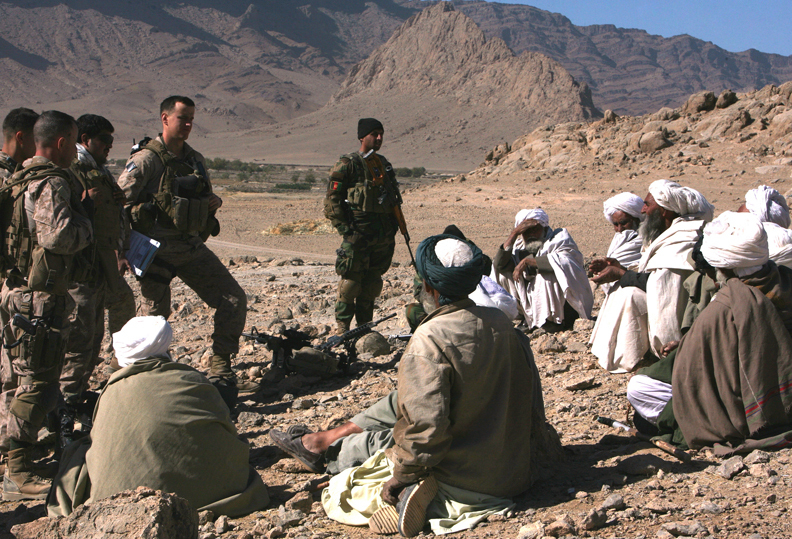 Gilbert is a 24-year-old from Clemmons, N.C.
2nd Lt. Robert R. Fafinski, a platoon commander with India Company, 3rd Battalion, 4th Marine Regiment speaks with elders from the village of She Gosa Janobi, Afghanistan as part of Operation North Star Nov. 16. Fafinski is a 24-year-old from Chaska, Minn.
Lance Cpl. 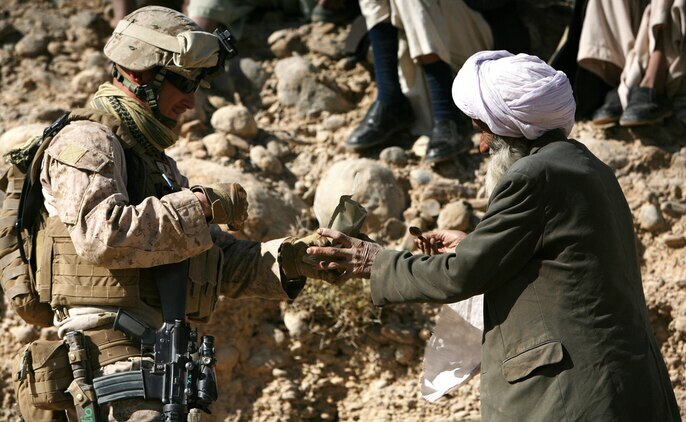 Douglas C. Gilbert, a mortar man with India Company, 3rd Battalion, 4th Marine Regiment opens a meal-ready-to-eat before giving it to an Afghan man during a patrol outside the village of Gund, Afghanistan Nov. 17. The patrol was part of Operation North Star and was part of an attempt to improve relations with local Afghans in the surrounding area. Gilbert is a 24-year-old from Clemmons, N.C.
FARAH PROVINCE, Afghanistan -- At first glance, the area known as the Buji Bhast Pass in southern Afghanistan looks much like the rest of Farah Province. Mountain peaks tower over vast desert valleys spotted with small adobe villages, herds of grazing animals and local farmers tilling their fields. Whereas other areas in the region are proving relatively receptive to coalition forces, the pass and surrounding towns remain a haven for Taliban fighters. Threats and kidnappings, made by armed enemy fighters in the dead of the night, have sent a wave of fear and compliance over local villagers. This forced obedience, coupled with a high number of Taliban fighters lurking in nearby mountains, has produced an area hazard to both coalition forces and local Afghans alike. The danger was apparent when Marines and sailors from India Company, 3rd Battalion, 4th Marine Regiment, visited surrounding towns of the Buji Bhast Pass area as part of Operation North Star Nov. 15-17. The key to securing the pass, which serves as a line of communication between the populated areas of Delaram and Golestan, lies in securing the trust and assistance of the local villagers. Before laying the foundation for a more permanent and healthier relationship with the villagers, coalition forces must first earn the respect and influence of the towns' elders. "The elders are key to holding any kind of relationship with the local populace," said 1st Lt. Scott Riley, 25, the executive officer for India Co. "They want to help the coalition forces. They want us there, and they make it well known, and the fact that the Taliban are still [in the area] really worries them." The operation initiated such a plan on the first day by visiting the town of Gund, which lies on the pass' southern door step, but the town quickly proved to be unlike other provincial areas. On past patrols, India Co. has often been greeted by the curious, but sociable farmer, or local children in search of gifts. Upon its arrival to Gund, the company was welcomed by Taliban gunfire from fighting positions in the surrounding mountains. Undeterred by an enemy incapable of matching the Marines' firepower, the patrol continued with its mission, and attended a shura with the town's elders the following day. The Taliban's fear of elders' power and influencing could encourage local Afghans to support the provisional government was evident shortly after the meeting had concluded. Taliban small-arms fire from the surrounding hills again targeted the Marines in a futile attempt to harass and disrupt any progressive discourse between the Marines and their Afghan hosts. "[The Taliban] responding to the shura in that matter. (By) shooting at us, they're just trying to reinforce their presence there to the locals. They wanted to let [the locals] know, 'Hey, we're still here, we see you talking to the coalition forces, and we don't like it,'" said Riley, a native of Wake Forest, N.C.
Taliban fighters increased their efforts to reinforce their influence over the region later in the day. This third attempt by insurgents targeted the Marines, using an improvised explosive device. "We turned around to look at how beautiful the valley was up there with all the mountains, when we saw a huge plume of smoke and dirt shoot up. Then we waited and eventually heard the explosion," said 2nd Lt. Robert Fafinski, a platoon commander with India Co. "We were pretty sure somebody had died, and eventually we were able to learn from the locals that it was the IED emplacers." The failed emplacement only strengthened the Marines' message that uninhibited Taliban movement and violence poses the same threat to local villagers as it does to coalition forces. As the operation moved to the nearby village of She Gosa Janobi, India Co. used the incident as an example of the Taliban's disregard for the safety of those Afghans living in the Buji Bhast area, and to promote coalition support of Afghan national security forces. Another shura was held with the elders of She Gosa Janobi, while dismounted patrols through the town allowed the Marines to speak with villagers directly. 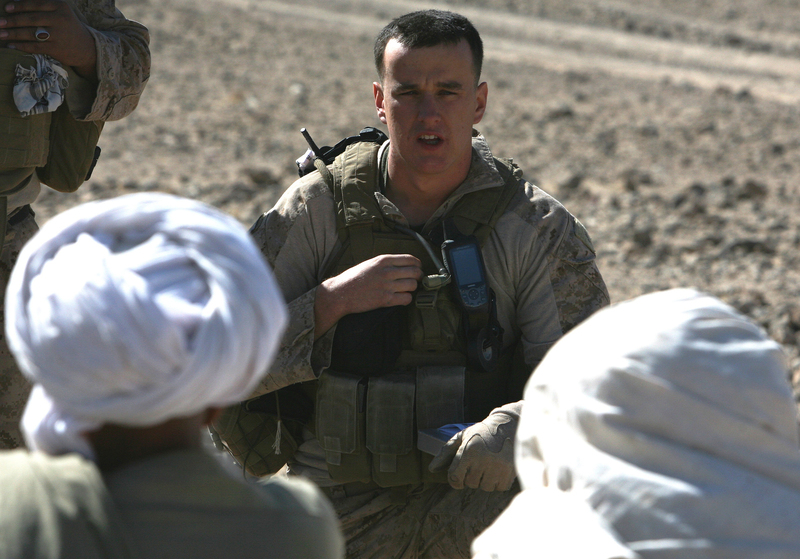 The Marines listened to local concerns about security, shared food with those in need, briefed local farmers and businessmen about new Afghan laws pertaining to agricultural fertilizer use, and dispersed hand-cranked radios. "We were able to pass out a good number of [radios]," said Fafinski, from Chaska, Minn. "It was very rewarding for the Marines to see the joy on the Afghan faces, when they heard music in their villages for probably the first time ever." In addition to playing music and the call for prayer, the radios will also help keep Afghans in the Buji Bhast area better informed about their role in safeguarding the local area.